Scrub away bacteria, unclog pores, draw out impurities and prevent future breakouts with this highly effective scrub. Our formula contains an Anti-Blemish Complex of natural ingredients Tea Tree, Willow Bark, Rosewood, Lavender and Chamomile, shown to be very effective on blemish-prone skin. Aloe, Chamomile and Corn Kernel Meal are included to soothe, calm and gently exfoliate skin. Use once or twice a week to help keep skin clear and fresh. For best results use with derma e® Very Clear® Cleanser, Very Clear® Moisturizer, and Very Clear® Spot Treatment. Inactive Ingredients: Purified Water, Cetyl Alcohol (Plant Derived), Prunus Armeniaca (Apricot) Seed Powder, Glyceryl Stearate Citrate (Vegetable Derived), Hydroxypropyl Starch Phosphate (Sugar Starch), Caprylic/Capric Triglyceride (Vegetable Derived), Glycerin (Vegetable Derived), Stearic Acid (Vegetable Derived), Decyl Glucoside (Plant Derived), Melaleuca Alternifolia (Tea Tree) Leaf Oil, Lavandula Angustifolia (Lavender) Oil, Aniba Rosodora (Rosewood) Wood Oil, Salix Alba (White Willow) Bark Extract, Allantoin, Organic Aloe Barbadensis (Aloe Vera) Gel Extract*, Organic Simmondsia Chinensis (Jojoba) Seed Oil*, Organic Chamomilla Recutita (Matricaria) Flower Extract*, Xanthan Gum, Polysorbate 60, Polysorbate 20, Glyceryl Stearate SE, Potassium Sorbate, Phenoxyethanol, Ethylhexylglycerin. I've been using this brand over 15 years now. The scrub feels great on my skin and helps rid me of tiny bumps turning into full blown pimples. Love this! This scrub helps keep my face clear of breakouts and has a great scent! I use this scrub every other day; it has helped keep my skin clear of acne and blemishes. I love the Derma E product line. I have cystic acne prone skin, but it drys out really fast and gets flaky .. I've had no issue with this product, it's the only product that's actually been helping me clear up. Great, simple scrub. Have repurchased several times. My daughter loves this product. She has acne and this scrub along with the cream helps keep it under control. We were buying it from a health food store and they couldn't get this product for 2 months and my daughter's face and back were horrible. I found this website and ordered her cream and within 2 weeks her face is again clear minus the random pimple. Great scrub, feels great and works well to help acne! This is a great cleanser- I am in my mid thirties and have hormonal acne. This helps it clear it up quickly without overdrying my skin! Very good scrub, face feels clean. Really nice product but I was surprised how big the scrubbing agent was. It's pretty rough and I was hoping for a smoother exfoliant. Great for what it is but not what I was looking for. This product is gentle, but still effective. I use this whole line of acne products, and my skin is much improved. 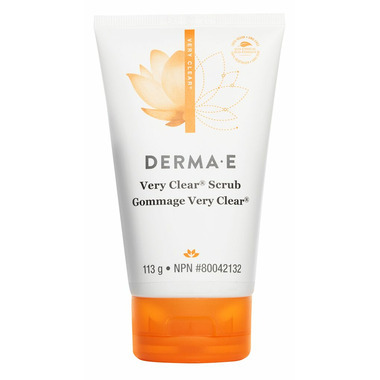 Love this scrub - feels like a deep clean and is clearing up my skin! Love this product! It is very refreshing and is a gentle scrub. It leaves my skin very smooth. This is my first time using this product but I will definitely recommend it to my friends! I love this! Have been using for over a year now. Gentle yet effective scrub. Leaves my face feeling clean and smooth. Like that it's a certified organic product. Love this face wash, it is a good scrub for acne prone skin. It rates well on the ewg's Skin deep website as well and has a nice smell. This product is light and gentle. My skin feels clean and not dry. I would recommend this scrub. The smell is too strong and it feels more like a cream cleanser than a scrub, but I do like the natural ingredients. So far this scrub hasn't dried out my skin, and has potentially helped clear up the acne I had on my forehead. I'll keep on using it to see the long-term results. If my skin remains clear then this stuff is a miracle in a tube. This is an effective, gentle scrub for my acne prone skin. I'd buy it again. Awesome scrub! Not to harsh and leaves my skin super clean and soft. Great facial scrub - actually feels like it's doing something! But not too harsh that my skin feels raw or dried out. Has a nice tea tree oil scent, so refreshing! Great exfoliant. Left my skin feeling smooth and tingly, clean and fresh. I think it did a great job of scrubbing off dead cells and wasn't too drying. Best I've tried yet! Sorry to say but it made me break out much more than my regular product. I gave it 6 weeks and now I'm back to my stand-by hoping I'm cleared up by Christmas. Didn't work for me at all.